Westborough attorney Carolyn R. Spring shares her experience and knowledge of law with the community. 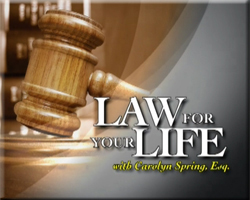 Each month, Law For Your Life will feature a different topic with expert guests. Among the topics will be estate planning, what happens inside a courtroom, preservation of the family home, bankruptcy and real estate law.